In November 2001, our family had the rare opportunity to meet with a Marine that served with Davis. Rich gave us all an amazing gift that day. Thinking of Davis so far away from home is alot less sad knowing he was with men like Rich. 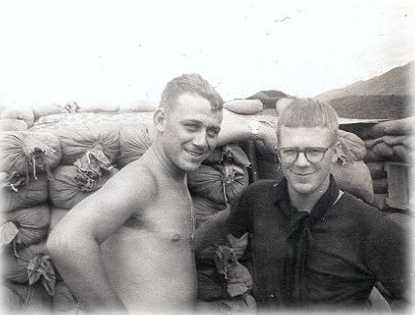 This is Richard Pierce (left) standing with Davis. Since we have had the honor of getting to know Rich, this photo from Davis' album is especially treasured. While Rich was on Hill 25, his girlfriend Kathy would send him good things to eat and music recorded on reel-to-reel tape. Rich shared these treats with the guys on the hill. Kathy still has a letter from Davis thanking her for all those goodies. After they were done listening to the music, Rich and the guys would record voice messages for Kathy and send them back to her. Rich and Kathy are married now over thirty years. She kept those tapes, and has made it possible for two families to hear the voices of those too long silent. Press play on the Windows Media player to hear Davis' Voice. "Davey was one great guy, a gentle and caring man that all of us liked alot, at times he seemed so fragile, it made you stop and wonder, what was he doing here. But I think down deep its where he wanted to be. He said he had a twin, I'd like to meet his brother someday. Davey and I are from the same state. I think of him often and I always will. Say hi to all the guys for me Davey. Love you man, till we meet again Rich." Since this post, Rich did meet with David (and seven other brothers and sisters). Rich shared so much with us all, and we are thankful for his gift. It was this meeting that inspired our memorial site.